Every now and then we bring home a book from the library that just captivates my children's attention. Over the weekend we stopped to pick up a book we had reserved from our local library. I always look through the Story of The World Activity guide and reserve books suggested for upcoming chapters. To tell you the truth, I had forgotten about reserving this book, so it was like getting a present when it was available. 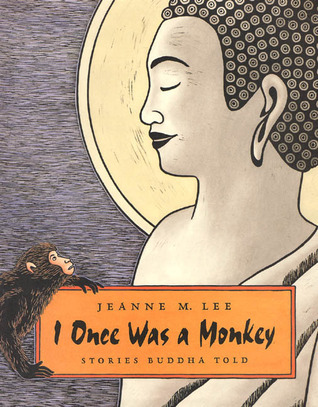 I Once Was A Monkey: Stories Buddah Told contains five stories from Buddha's famous fables, Jataka Tales (or birth stories). In each story, a bit of wisdom is conveyed from Buddah to a group of animals listening to him in a cave. The tales were originally told to Buddah's disciples to help spread his teachings. Each tale begins with a different incarnation of Buddah (which in itself led to some great discussion with my children) and ends with a message of peace, attentiveness, tolerance or respect. The illustrations are beautiful, and alternate between black and white and color, to denote when new stories begin and end. One of the reasons I love The Story of The World so much is the broad view of history it gives my children. It exposes them to many religions, viewpoints, and doesn't shelter them from a whole lot. Some people do not use Story of The World for these reasons, but they are the reasons I DID choose this history spine. Even my six year old could articulate to me that we, as Christians, don't believe you "come back as something different" after you die. Now he knows, however, that Buddhists do have this belief. In addition to this wonderful book, we are also finishing Caddie Woodlawn this week. What is your current read? I'm happily linking with Amy today!